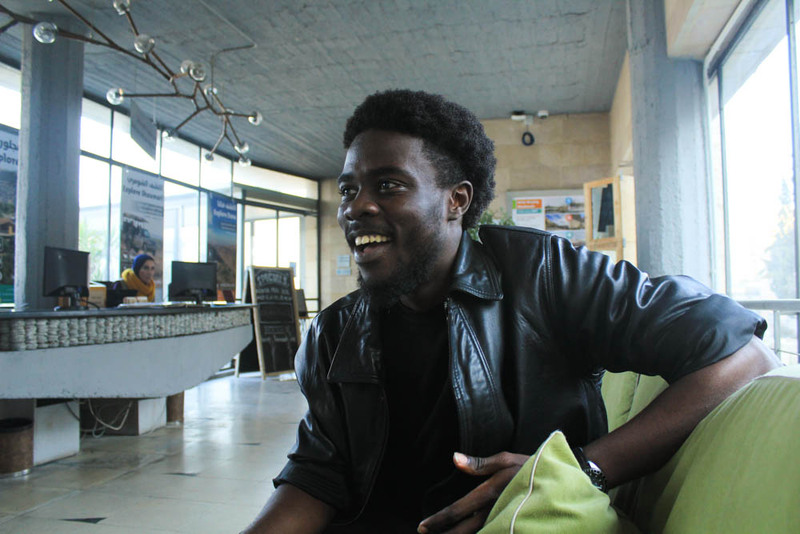 One Nigerian is trying to promote a way to peace and equality through the use of everyday communications. 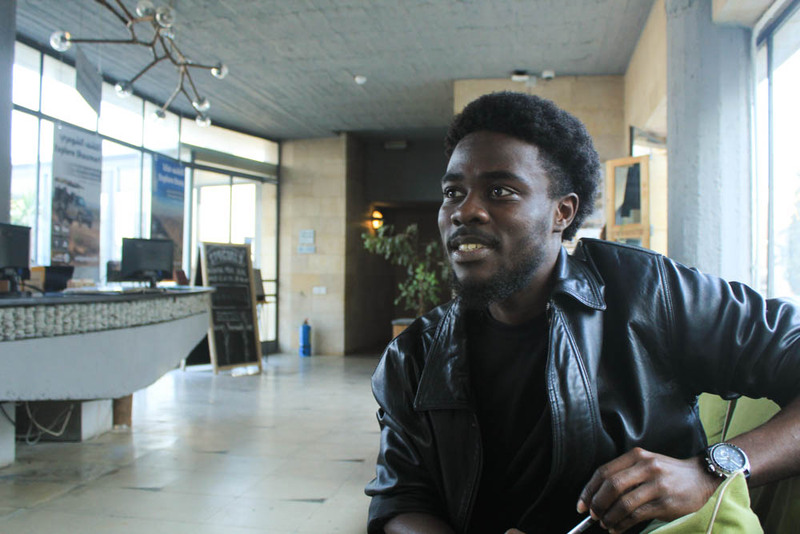 Arabi Tobi is a writer and artist from Lagos, West Africa currently studying literature in Jordan. Having gone through the challenges in his life, he sought to achieve a more peaceful method in facing everyday conflicts. “My goal has always been change in the way we exist,” he said. “This existence – the way people actually relate to each other – it still doesn’t pronounce equality. “I think all I want is just to live in a world where we can get together to make combine efforts with mutual understandings with each other’s lives, and it’s all about having a better world. “Because where I come from people just want to exploit each other and make themselves better; that’s all they want, they want to make themselves better and they don’t care what the other person feels and how it affects them. 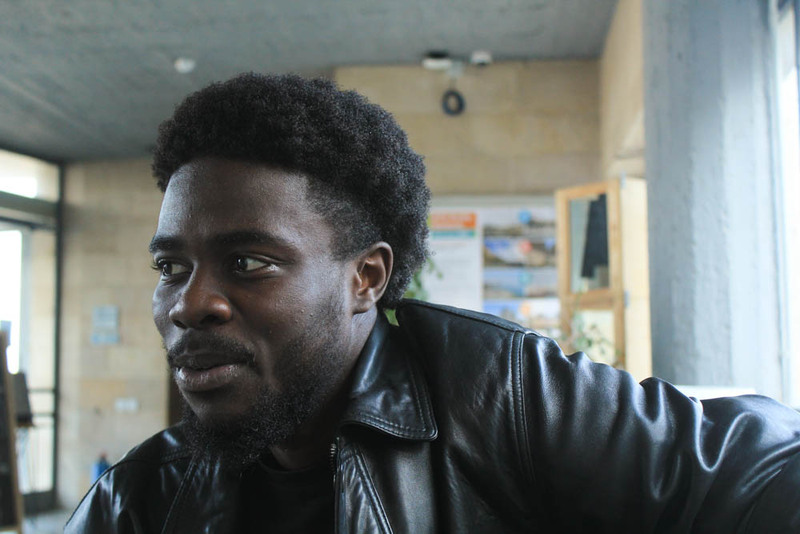 The West African local saw that people lacked understanding towards each other and needed a better way of connecting. “I think it’s communications,” he said. “Getting people to actually communicate with each other – not just talking; communications actually deals with you understanding each other. “People look at me talking to people and they say ‘look at you, it’s easy for you’ but really, it’s not,” Tobi explained. “Some people just smile while you’re there and when you turn your backs, they just say something else. The Lagos local said it was not easy in trying to achieve mutual understanding and even many people – especially from his own country – still portrays a sense of bias and negativity. 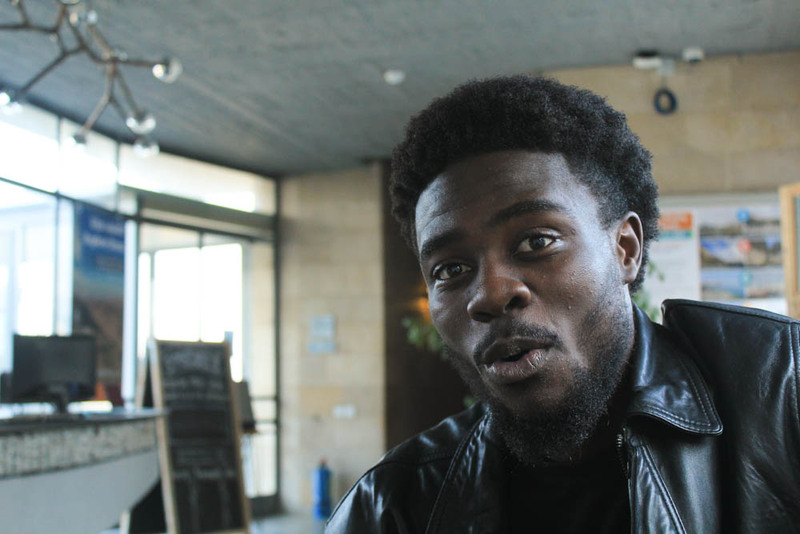 “I came to Jordan through some people who came from the same country as me that still were exhibiting what I was actually against,” he said. “They were supposed to be; we had kind of a mutual background, you should be kind of close to me, but they still exhibit these things I want to be erased from the world. “They hate, they envious, they just try to get you down so they can get up. Tobi explained how he was trying to create these forms of communications. “There’re a million ways, my way is; I write, I draw, I’m an artist,” he said. “Most of my work is filled with emotions and I think the work I need to do to actually get to this aim is not actually physical interaction, it’s more work of the mind. “If I can find a way to actually communicate with the mind – through art, writing – I think I can actually make people think about the things I want them to think about. “I think it will be easier for them to make decisions, easier to take action and actually make the world a better place. “All I’m trying to do is try and find a way to connect with people’s minds, not just their face, not just their bodies, not just something that will make them smile for a bit; something that will actually impact them in their minds and then they will go home and actually think about it. Tobi said having faced through many discriminations has taught him to be more thoughtful and not judge a book by its cover. “When I got to Jordan, lot’s of things happened that were not too good for sensitive people,” he said. “The first house I lived, there were kids there – because I was a different color, they literally stoned me while I was walking. “Called me a black man – Abu Samah (ابو سمرة). “Called me these names; the first week, the second week they kept doing it, but then whenever they do it, I just smile at them and then I go. “Sometimes I’m just too lazy to reply them and I got to know that – they’re kids – it’s not what they want, it’s what they’re taught. “People have shown them, what has been passed on to them, they didn’t just decide to do this. “Now these kids are like my best friends on the street, when they see me, they would call me and ask me questions in Arabic, wanting to learn more English words and they’re so good to me. Tobi said people should show more respect in understanding each other and seeing different perspectives through the eyes of others. 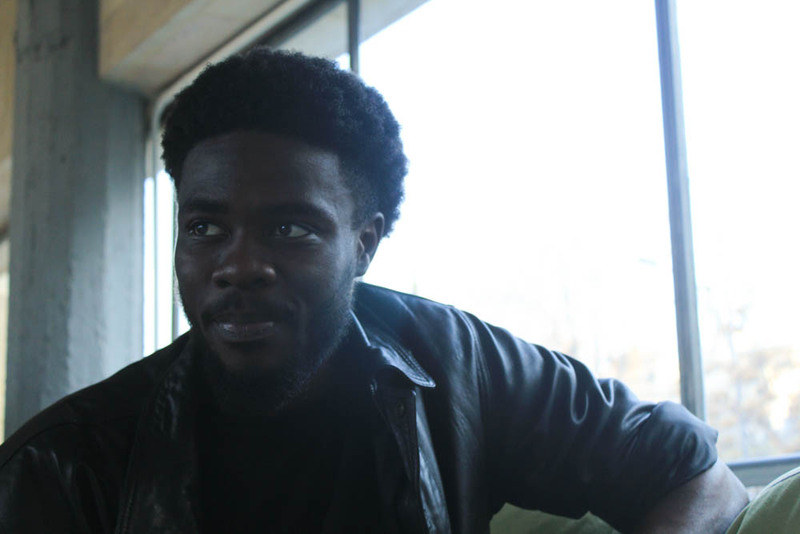 “The Nigerians here tell me I have too many friends and they have no friends,” he said. “Kids call them and Jordanians call them Abu Samah and they just walk away with a straight face. “There’s this word in Arabic that means mohtaram (محترم), which means respect. “I was walking with this Nigerian once and somebody said the same thing Abu Samah and I just said assalamualaikum (السلام عليكم) – which means peace be upon you – and [the Jordanian] said mohtaram. “That Nigerian, after he saw me do that, he came back and smiled and said the same thing assalamualaikum. “That was the last time that guy said Abu Samah to us, when he saw us again he said assalamualaikum. “It’s been working with me; I calmed down with them, I don’t look at them from the shell, I never do that, I don’t look at them from the way others look at them. The Nigerian stated another example of when being patient has paid off. “Once when I was at the gym, there was this guy that called me Abu Samah and when he said that I gave him a straight face and then he came to me and asked why I gave him that face and I told him that I don’t like that name,” he said. “‘Well, it means black man and I don’t want it.’ This person now had started to meet other people and questioning, when he said Abu Samah. However, racism is something that happens everywhere and for some, it’s just inevitable. “Racism happens everywhere, just in different forms,” he said. 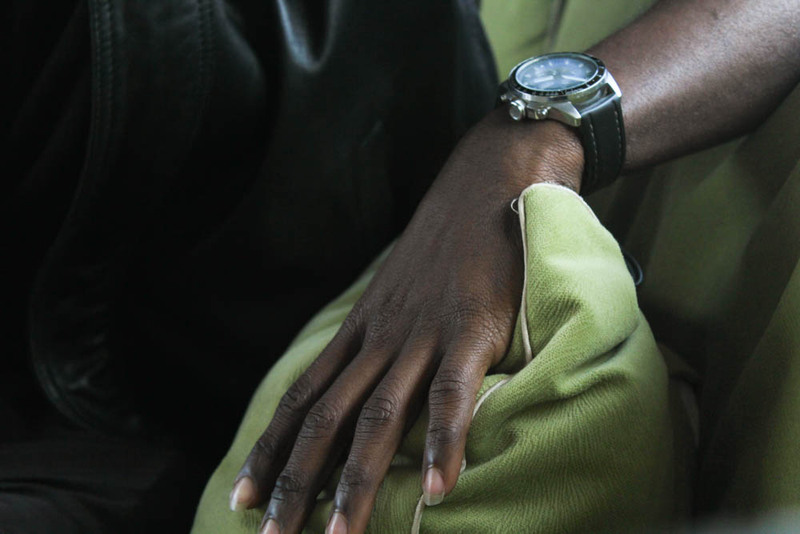 “Back in Nigeria, it doesn’t come as racism, even though there are a lot of racism, especially in terms of color. “Like if you’re white and you come to Nigeria without any credentials, any education, or experience, you would get a job more easily. “They believe you’re smarter and the one who actually got an education, they won’t get what you get. Tobi however, saw similarities everywhere; he himself having had negative judgments towards people of different race. He had even stated of his bias perceptions towards Muslims and Arabs. “I grew up with this belief that Muslims were terrorists,” he said. “If you see someone with a beard or dishdash, I would think they have a gun or a bomb. “However, now I learned something about Islam and I reverted. “I connected with their beliefs but I also learned lessons. Islam means peace — that’s the meaning of the word. “Muslims here in Jordan, they are good people. “When I was in Nigeria, every time I saw a person with a beard, I would run. The first month I was here, when I saw somebody with a big beard and it was red, I crossed over and I almost got knocked down – really I ran away. “I thought about that – they call them Sheiks, and when you see them they are the ones with the biggest smile on their faces. Tobi explained that it was very easy for people to get angry at each other and was not always an easy emotion to surpass. “Immediately the first thing we do is get angry,” he said. “As an expression, when somebody gets you really mad and you can’t control it, you sit down – if you’re standing. “If you’re still angry while sitting, sit on the floor, if you’re still angry, lie down; it gets funny and then you get better. So that’s exactly what I do. 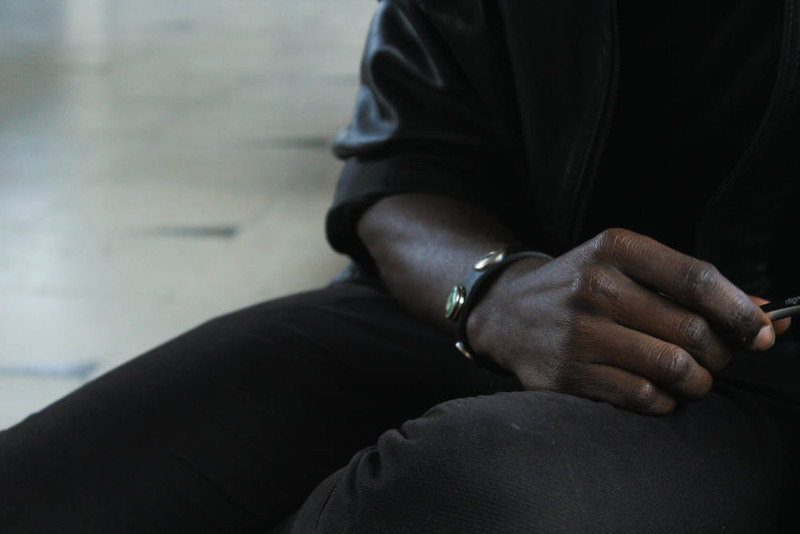 “When I got robbed, it really pained me,” Tobi recounted his experience. “I lost a lot of work, my computer, and my most important possessions were gone. “When the cops came they were supposed to help me, but I was not important enough and I got very angry, but now, the same cops they’re my friends. “When I went to meet them at the station, I talked to them in a very light and friendly manner and I mentioned something that will interest them – I just wanted to make friends with them – so I mentioned mansaf and they like foreigners that like mansaf. In the end, Tobi said he had always sought his patience through his ultimate inspiration, his family. “The inspirational part about myself has always been my family,” he said. “My mom moulded me, my brothers moulded me. We lived in a very hostile environment, it wasn’t easy. “We were three brothers, one woman. We have our own difference inside the house, I mean, we fight and stuff, but we get through it. “We just hold each other and make sure that the message will pass within ourselves to others; that will make people want to feel better with others. So make sure the message is passed with your actions, your behaviours, your craft – anything you do. 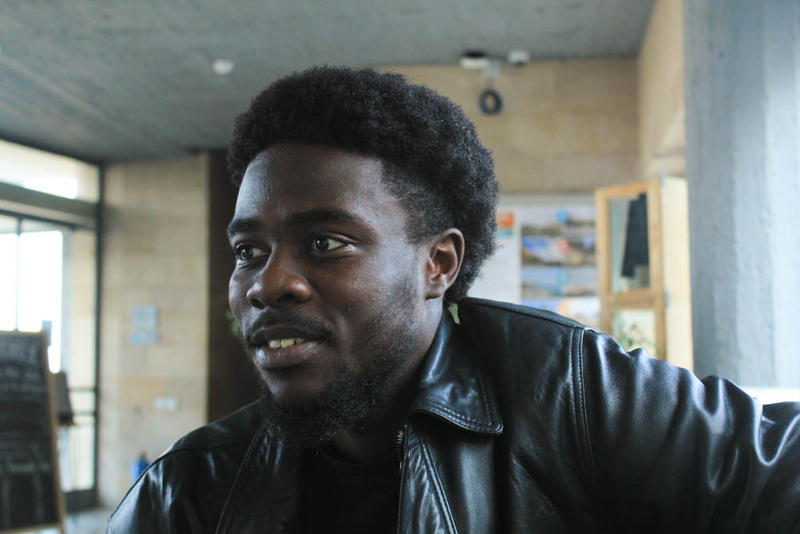 Arabi Tobi is a Nigerian local from the city of Lagos currently studying literature in the university of Jordan. He is an artist, writer, and former model. 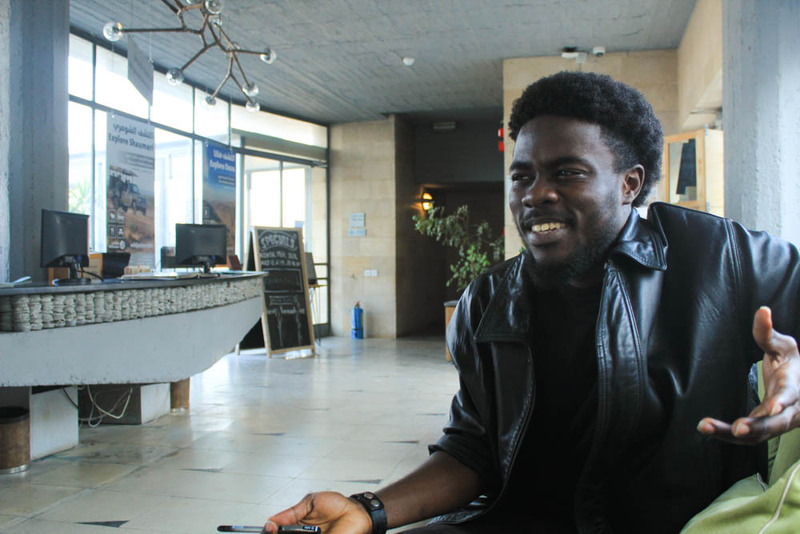 With the determination of a better education and escaping current recessions in Nigeria, Tobi got to Jordan – after facing many hardships in trying to find the best education and the full support of his mother. 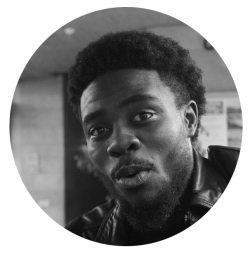 Tobi aims for peace and equality through the use of proper communications and is currently a regular writer for Hybris Media. My only comment is that i call it lack of knowledge to just convince myself how to deal with this type of attitude. You will get there! .One of d yardsticks to the platform of success is determination,which you have, go on, no negotiations. This is such a great message. Thank you interviewing Tobi. He has such an interesting life and wonderful morals. All people should be more like him. I also personally believe the same way as Tobi but have to admit that I’m not good at keeping my anger in check. Keep up the awesome work Hubris Media. I will keep on supporting you.